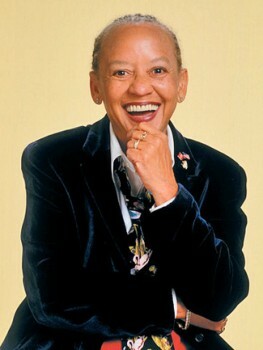 I think the picture we have been running of Nikki Giovanni is the most charming photo we have ever had of one our speakers. But believe me, the woman does not suffer fools gladly. Listen in to this appearance when some one from the audience asks her opinion of Quentin Tarrentino’s Django Unbound. And that is just the start of it. We can hope for similar fireworks at the Kessler Theater on December 8. Of course she will also be reading from her latest book of poetry, which she will be signing after the show. Tickets are available on Prekindle. Now settle back for the fireworks on Django, The Butler, Precious, and Mississippi Burning. evening will begin with a solo set by Betty Soo, a rising star on the folk rock circuit from Austin who has already had several successful shows at the Kessler. 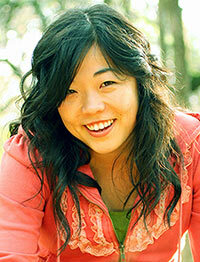 BettySoo’s voice is the perfect combination of strength, vulnerability and clarity. She has been named the Kerrville New Folk Winner, the Mountain Stage New Song Competition Winner, and won the Big Top Chautauqua Songwriter of the Year. The Houston Post referred her as “The Real Deal,” which also coincidentally is the name WordSpace has given to the evening with Nikki Giovanni. Tickets for Nikki Giovanni, with Betty Soo and the winner of the Metroplex area poetry slam are available on Prekindle. While deciding how many to buy, enjoy this video of Betty Soo in performance. At WordSpace we proudly present each of our readers at the fifty or so events we sponsor each year. But on December 8, we both proudly present and are honored to present Nikki Giovanni at the Kessler Theater. Nikki Giovanni is a poet of passion and intellect whose verse, for the past forty years, has embraced everything from the raucous rhythms of hip hop to the formal elegance of the greatest of modern poets. Early in her career she was dubbed the “Princess of Black Poetry.” That has a certain fairy-tale ring to it, but more recently she has been acknowledged as both a National Treasure and appeared on the list of Oprah Winfrey”s Living Legends. them.) There will also be music from BettySoo, a rising star on the Austin song circuit, and a special appearance by the winner of a local poetry slam held specifically to offer one Dallas area poet the chance to appear on the same stage as Ms. Giovanni. Tickets for Nikki Giovanni: The Real Deal are available on Prekindle. During the next two weeks WordSpace will be posting frequent excepts from earlier perfomances, lectures, and interviews with Nikki Giovanni. Here is her response to the death of Tupac Shakur from a performance in 1997. 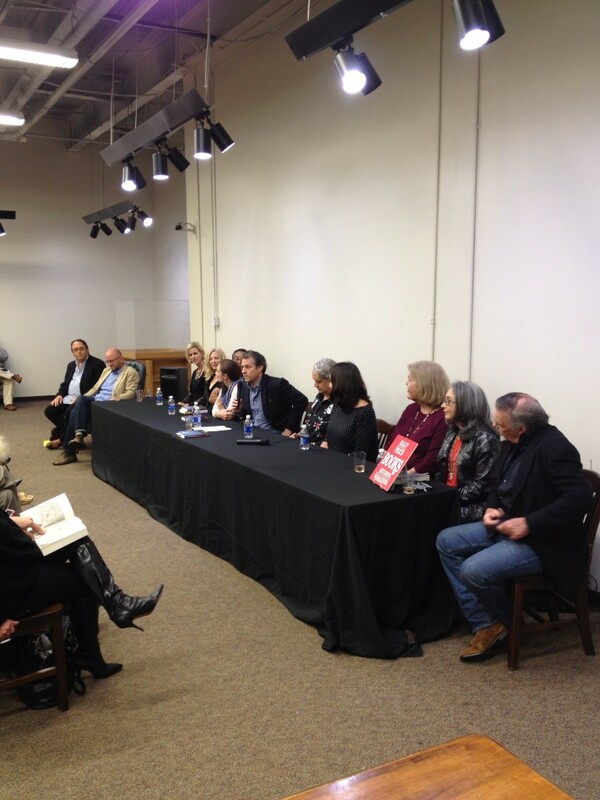 On October 30, Half Price Books on Northwest Highway in Dallas hosted a book launch for Dallas Noir. This volume, from the remarkable literary press Akashic Books, puts Dallas into the esteemed company of New York City, Los Angeles, Boston, Paris, Istanbul, and over forty other metropolis’s whose native authors revel in showing their beloved hometowns at their absolute worst. WordSpace is proud to say that we have hosted in the past year two contributors to this volume and will bring you a reading by a third in January 2014. Ben Fountain did his first public reading from Billy Lynn’s Long Halftime Walk at a WordSpace salon months before it won the National Book Critics Circle Award. 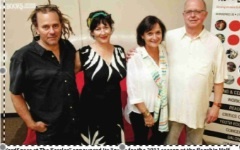 Will Bondurant, whose second novel The Wettest County in the World became the film Lawless, also did a salon event. In January 2014, David Haynes will be reading from his soon to be released seventh novel. These three join seventeen other Dallasites who offer up all the mayhem and low behavior you could hope for. Since it is all conveniently organized by neighborhood, you can quickly find out what your neighbors are getting up to. Your worst suspicions will be deliriously realized. Dallas Noir is available wherever fine books are sold. Half Price Books sold out of their first shipment at the launch party, but more are on the way. Best advice is to buy a ticket. A handful of tickets for Sandra Bernhard’s appearance on October 23 at the Kessler Theater remain available through Prekindle. Once seats are gone, a limited number of standing room seats will become available on Prekindle, and any remaining standing room will be available at the door. Shop early for best selection. As of this writing there is even one front row table available if you feel like treating yourself and three of your friends to a real night on the town. We have Half Price Books, our season sponsor, to thank for getting us into the DBJ. Next we are aiming for the front page of the Wall Street Journal. SO WHAT DO YOU REALLY THINK, MS. BERNHARD? OK, that question is facetious. Sandra Bernhard has not made a name for herself by not speaking her mind, on any topic and in any venue. We look forward to her doing the same at the Kessler Theater on October 23 at 8:00. 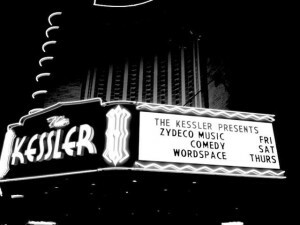 She opens the WordSpace at the Kessler season which will also include appearances by Nikki Giovanni, Laurie Anderson, and John Waters. Tickets for Sandra Bernhard and Nikki Giovanni are currently available at Prekindle. What can you expect from Sandra Bernhard at the Kessler? We can only hope, as Bette Davis said in All About Eve, that we should fasten our seats belts for a bumpy night. Yes, we want your money, but we are also going to give you a show. 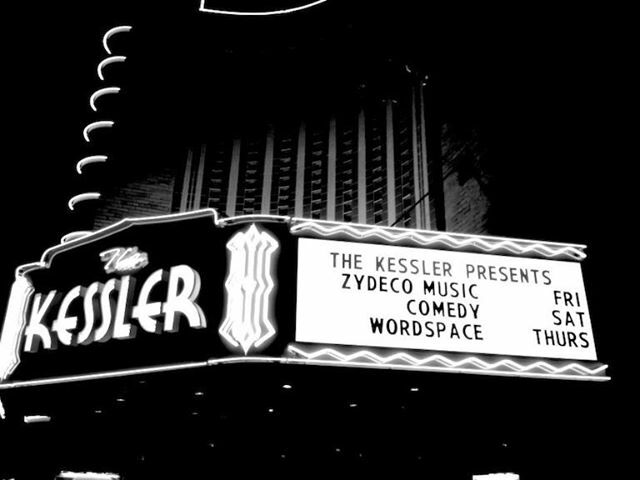 On September 19, WordSpace at the Kessler Theater presents Word Up, an evening of cabaret-style spoken word performances by the Word Up All Stars: Matt Bagley, Michael Clay, The Dallas Poetry Slam Team, The Andy Don Emmons Revival, Randall Garrett, Joseph Justin, William Bryan Massey III, Rosemary Meza-DesPlas, Carlos Salas, Opalina Salas, Bruce Webb, Josh Weir and Laney Yarber. Performances are from 7 – 10 PM in the bar of the Kessler Theater, 1230 West Davis Street. YOU NEED NOT BE PRESENT TO GIVE!! TheDonor Bridge website will be open for business from 7:00 am till midnight on September 19. For the direct link to WordSpace Donor Bridge page: CLICK HERE. The process is fantastically simple. Or drop by the Kessler for the party. Our helpful board volunteers and staff will be on hand to make your credit card donations through the Donor Bridge website. You can give a little or a lot. For more information on Word Up and all WordSpace activities go to our website or visit us (and Like us) on Facebook. Bonnie Friedman’s essays tend to make their way into a lot of “Best of…” anthologies. She has been in such anthologies as The Best American Movie Writing, The Best Writing on Writing, The Best Spiritual Writing, and The Best of The Oprah Magazine. 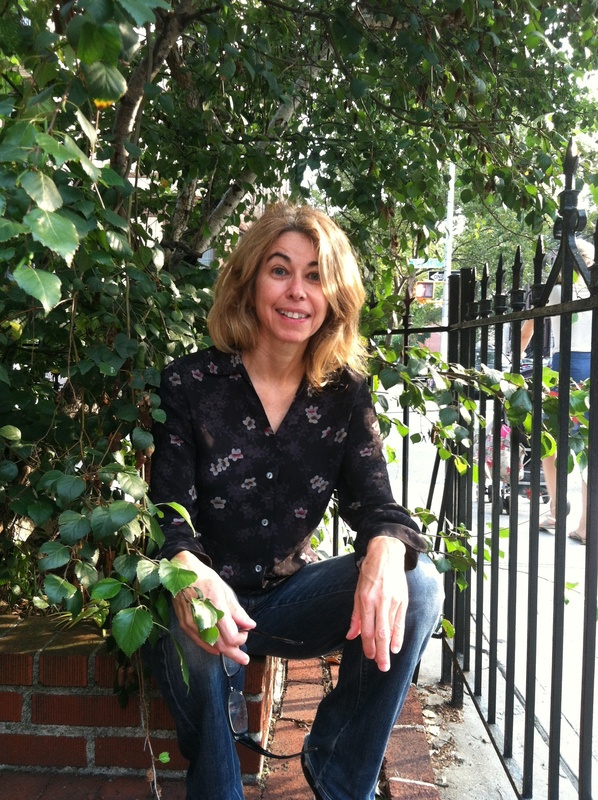 Her first book, Envy, Fear, Distraction, and Other Dilemmas of the Writer’s Life as a Village Voice bestseller. Friedman, who currently teaches Creative Nonfiction in the MFA program at the University of North Texas, will read new work at the WordSpace Salon on Thursday, September 12. To sample her writing, check out this essay published on Shambhala Sun — and find out why this blog post has the title it does. Since salons are held in private homes, we do not publish the address until guests RSVP at 214-838-3554 or via email at wordspace@wordspace.us. SANDRA BERNHARD — October 23, 2013. Remember when she and Robert de Niro kidnapped Jerry Lewis in Martin Scorcese’s The King of Comedy? 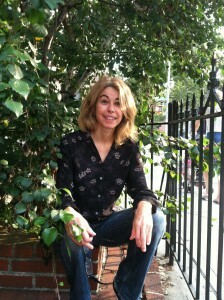 She may not be taking prisoners at the Kessler, but expect an evening of her no-holds-barred brand of comedy. She has requested that we provide a grand piano for the stage. We at WordSpace were a bit taken aback by the cost, but you know, even if she merely drapes herself across it, the money has been well spent. NIKKI GIOVANNI — December 8, 2013. This is the point when I am supposed to list all the awards and honorary degrees this remarkable poet has received, but you can read about those on the WordSpace website. I’ll just say that it is a long and impressive list, but here’s the cool part. Robert Baker, a researcher at Texas Tech University and major Gioivannii fan, discovered a new species of bat in Equador and named it after the poet. For those whose Latin is a little shaky. the Micronycteris giovanniae can also be called Giovanni’s small night flyer. LAURIE ANDERSON kicks off the 2014 season on March 13. 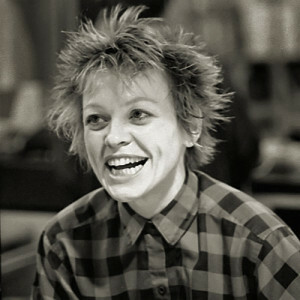 Laurie Anderson has been presenting dazzling multi-media stage shows since her premiere with Oh, Superman in 1981. She is a singer, a storyteller. a composer, and a virtuoso of the neon violin. The Kessler offers an unusually intimate setting to see this mega-star working her special brand of stage magic. JOHN WATERS — May 29. It has come to our attention that many of what we have come to think of as “the younger crowd” know Mr. Waters only through his delightful, PG musical Hairspray. If you are too young to have had your mind twisted and possibly your life changed by such transgressive midnight masterpieces of the 1970’s as Pink Flamingo’s and Female Trouble, his one man presentation of This Filthy World will be your chance to catch up. Mr. Waters has asked only for a stool, a cordless mike, and a spotlight. But what more does a born showman need? 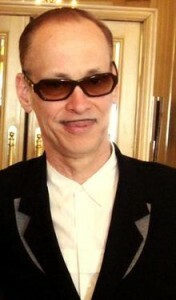 Tickets for both Laurie Anderson and John Waters will go on sale after January, 2014. Watch both the WordSpace website and Prekindle for updated information.